Many reforms on trade and conflict promised in Prime Minister Tony Blair's Africa Commission Report last year have yet to materialise, according to Oxfam. The aid agency said real advances had been made on aid and debt relief, but opportunities were being missed on fairer trade and arms dealing. However, International Development Secretary Hilary Benn said large portions of debt had been written off. He said a new humanitarian fund would also help combat famine in Africa. Campaigner Bob Geldof told the BBC it was critical that a trade deal for Africa was agreed. He said: "If we do not do a trade round, it will be a car crash for Africa. We must get a stand alone trade deal for Africa." He said the Africa Commission was the "benchmark report" which "everything was measured against". Mr Geldof praised progress made on debt cancellation and added that it not be "beyond the wit of man" to also achieve a doubling of aid by 2010. Adrian Lovett, Oxfam's campaigns director, told the BBC Britain should show leadership over a possible arms trade treaty. Hilary Benn said: "On debt in January we saw the debts owed to the International monetary fund by 19 of the world's poorest countries written off." He said it was hoped that the same would happen to the debts owed to the World Bank and the African Development Bank in July of this year. Mr Benn added: "We've seen agreement on a new UN Convention against corruption, which Britain has now ratified." He also revealed that a new humanitarian fund which was recently launched would aim to relieve crisis in the horn of Africa where seven and a half million people are at risk of starvation. The commission's report a year ago was a British-led initiative designed to make major changes in African development. It called on rich countries to increase aid to Africa by $25bn (about £14.5bn) a year by 2010, and by a further $25bn each year by 2015. It also urged them to cancel debt and dismantle trade barriers. And it called on African leaders to play their part in improving accountability and fighting corruption. The report was followed by a summit of the G8 leading industrialised nations which focused on the problems of Africa. The eight leaders agreed to write off $40bn (£23bn) of debt and to meet the commission's recommendation that aid for Africa should go up by $25bn (£14bn) dollars by 2010. Oxfam said the debt relief and aid increases were great achievements where the British Government showed real leadership. But it says the Department of Trade and Industry was allowing the EU to push through a deal that would harm poorer countries by offering no substantial cuts in agricultural subsidies while demanding poor countries open their industrial markets to unfair competition. "If the British Government is genuinely serious about its role as a champion of Africa's needs and of development, then they need to speak out publicly in favour of developing country demands," said Oxfam's director Barbara Stocking. The government should also "rip up the bad deal being sought by the EU in the name of the British government and other member states". 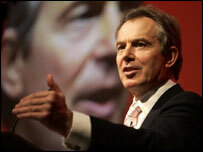 Earlier this week, Mr Blair said the fight against poverty in Africa depended on everyone working together. Meanwhile, Liberal Democrat MP Andrew George has accused the government of showing more concern for pre-election spin than the substance of following up the commission report recommendations. Mr George, who has written to Mr Blair to urge a speedier fulfilment of the recommendations, said: "It's all very well making more and more commitments, but at some point the government needs to start working out the processes by which the commitments can be implemented." The prime minister's official spokesman said: "If you look at the expert opinion across the board, they recognise that compared to where we were pre-Africa Commission report, pre-G8, that we have come a long way. "But the prime minister is the first to say that we need to keep pushing down the track and we will do so. But I think people should recognise the progress that equally has been made."